Roughly chop the onion and tomato, and finely mince the ginger and garlic. Bring the oil to heat on high in a medium saucepan. When it’s hot, sauté the onion for two minutes. Then tip in the ginger and garlic and cook for another two minutes until they turn golden. Stir through the coriander and cumin and cook for two minutes adding a splash of water if the mixture starts getting stuck to the bottom of the pan. Then add the chopped tomato and fry for five minutes until the tomatoes disintegrate. When they do, lower the flame and simmer for 5 minutes until you can see the oil coming out from the sides of the mixture. When the oil shows up, rinse and add the chickpeas. Give it a good stir, add a cup of water, the garam masala and simmer for 10 minutes until the curry thickens and coats the chickpeas. 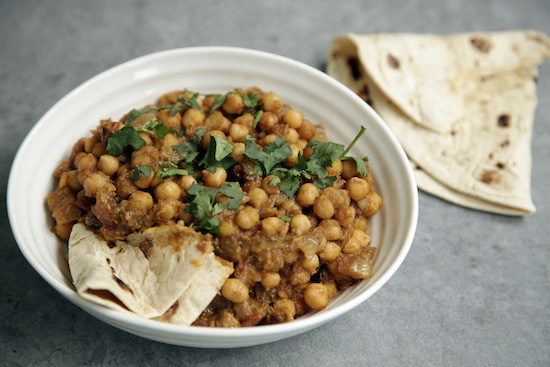 Add salt to taste and garnish with fresh coriander to serve your quick chana masala. Definitely on my “To Do and Inhale” list. We normally use chana/chole bought from the market and not the tinned variety. Should it be boiled before adding to the spice mix? Hi Mallika, My recipe is almost identical. I pretty much do the same till the last step where I actually pressure cook for only one whistle instead of simmering. I found that the chana soaks in the flavor better. The recipe is a never fail and very tasty. This Is My Favourite Recipe. Thanks For Sharing. Amazing Recipe. Thanks For sharing This Recipe. Your recipe looks beyond delicious. My friend is coming over tomorrow so I’m gonna prepare this recipe, I bet she’ll love it. Thank you for sharing it! It is really a very delicious recipe! I learned it from my Indian friend. By the way thanks for sharing it! nice post dear, so yummy Chana Masala dish. it’s so delicious dish……. When do you add the chili powder? Very nice and interesting recipe. Visit http://www.khojarecipes.com for the famous Khoja Gujarati Traditional Recipes. Looks tempting. Punjabis use to have this in breakfast. It’s very famous in India. People in India serve this Chana masala to their guest. It tastes so good with red gravy paste and with some masala. you and your Quick Chana Masala recipe both are very good, its really nice. its helps to new learners. chana is one of my favorite food. This recopies looks very yummy. Chana and rice are my favorite combination. Thanks for sharing this post.